Every year around this time friends and coworkers ask if I'm attending the Chicago Cubs home opener. While I would enjoy seeing the new video board in left field and the unfinished bleachers, I am not attending. In fact, I have only attended three home openers. Two were in Chicago and one on the road. In Arlington, Texas of all places. My first home opener was planned as a day-night double header. Being truthful, it wasn't even originally scheduled as opening day. 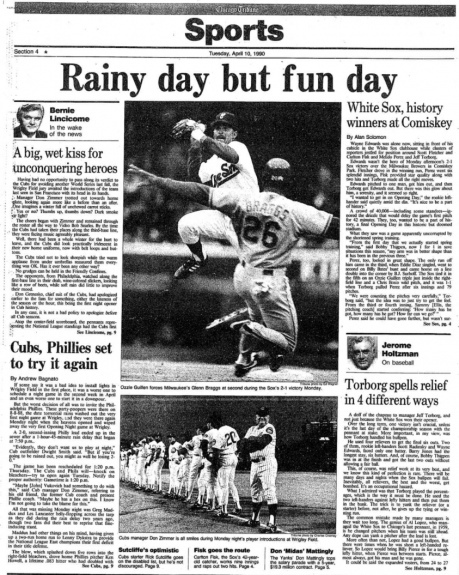 Let's rewind 25 years and go back to opening day in 1990. George H. W. Bush was in the White House, the U.S. had yet to initiate Operations Desert Shield and Desert Storm, and a brief labor dispute prior to the start of the regular season led to the cancellation of the each MLB team's first week of the year. Traditionally, the Cubs and White Sox begin each campaign apart. One team played in Chicago while the other opened on the road. That is still the practice today. But on Monday, April 9, 1990 that wasn't so. Night baseball at Wrigley Field was still a novelty at the time. The Cubs were known for day baseball under the searing summer sun. Even chilly afternoons in early April felt warm because baseball was back and the games mattered. Since several games were cancelled in advance of April 9, the White Sox found themselves at home that afternoon with a 1:30 p.m. start. The Cubs were slated to host their first night game of the season at 7:05 p.m. Very unusual roles for the two teams. White Sox fans were lamenting the pending demise of their 80-year-old shrine, Comiskey Park. The new Comiskey Park, later renamed U.S. Cellular Field, was seen rising over the first base grandstand. With these tickets, my Dad and I found ourselves at a cool and drizzly historic baseball moment. 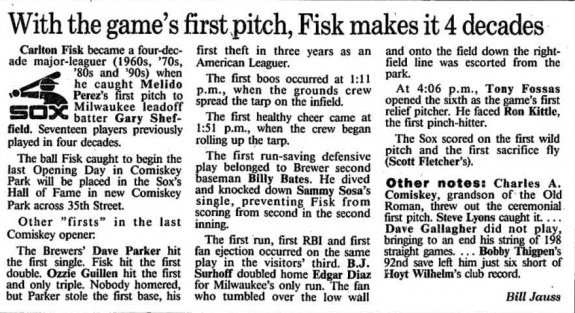 That game marked the final opening day at Comiskey Park, the so-called Baseball Palace of the World. The White Sox defeated the Milwaukee Brewers, still members of the American League, that afternoon by a score of 2-1. That was the team's first of 94 wins that season, good enough for second place in the American League West. They finished nine games behind the division-winning, and pennant-winning Oakland Athletics. Following a quick trip north on the CTA's North-South Route (what is now known as the Red Line), we arrived at Wrigley Field. Night baseball was in its infancy on the north side. Slightly more than a dozen evening games were allowed each season due to City Council restrictions in response to neighborhood cries. So 1990 was only the second full season to feature night baseball in the old ballpark. 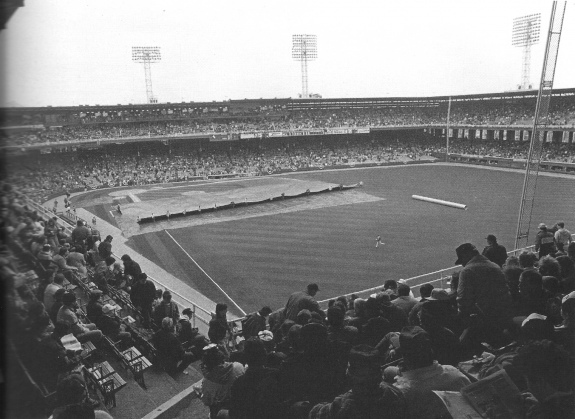 The Cubs hosted the Philadelphia Phillies in the ballpark's first opening day night game in history that evening. That was until the rain came. The Phillies grabbed a 2-0 lead when Lenny Dykstra belted a two-run homer off of Greg Maddux. About one hour after the game started, the rain forced a delay of almost two hours and washed the game out of the history books. Tonight, the Chicago Cubs and Major League Baseball decided the 25-year wait is over. They will attempt to host the 101-year-old ballpark's first opening night game against the St. Louis Cardinals. The second-to-last home series of that season was the last chance I had to say goodbye to the old park. I haven't been back to Chicago since and thus have yet to even step foot in Comiskey's replacement. I do have a lot of fond memories of the place since I became a Sox fan in 1970. I still feel sad when I see pictures of the park's demolition. I hate when we destroy our history in the name of progress.